It seems like every summer is tough on our lawns, and this year was no exception. Many of our lawns are suffering from dead patches and areas of poor grass quality and encroaching weeds. This fall is a great time to remedy some of these conditions through reseeding and fertilizing your lawn. In this article, we will focus on reseeding. Did you know… the fall is actually the best time of the year to seed? By seeding now, you will see quick results because the soil is warm and the days/nights are cooler. Unlike the spring, you do not have to wait for the soil to warm up from a cold winter. Also the days and nights are cooler, so the soil will not dry out as quick and grass seed will stay moist for longer. This goes a long way to seeing great grass seed results. With quick germination, you reduce the chance of weeds from growing in these bare spots before the grass seed has a chance to thicken in. 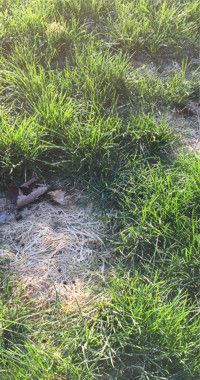 What is the best type of grass seed to use for my lawn? This answer depends on what type of conditions your lawn experiences. The more shade that you receive, the more fine fescues that you will want to have in a mix. The more sun you receive, the more ryegrass and tall fescues that you will want to have in the mix. There are many great choices but the fact is that most are very similar. They are all typically made from the same turf types, but the proportions of the mixture will vary depending on how much sun the area will get. Of course, our sales clerks are here to help you with this choice. What we often find is that one part of the lawn will need a mix that is more sun/drought tolerate and certain parts would do better with a more shade tolerate mixture, so you might need to consider a few different bags. Prepare the soil. Remove dead turf and kill or pull weeds in the areas of concern. It is important to have “seed to soil contact” so all of the dead grass will need to be removed to ensure a nice bed of soil for seed germination. Make sure that the top 1/2″ to 1″ of soil is loose and loamy so that the tender roots of young plants can find water and nutrients. Apply grass seed, mulch and fertilizer. Use top quality grass seed mixes, like those from Scotts and Jonathan Green. Sprinkle the grass seed moderately, sort of like “sprinkles on a cookie!” Mulch and fertilizer are optional, but recommended for the best results. We suggest that you try spagnum peat moss as the mulch. This product is the main ingredient in potting soils, so it is lightweight, inexpensive, and very moisture retentive! Fertilizer should be the last application. You will want to use a starter fertilizer or a fall fertilizer as long as it does not have any weed control in it. Water regularly. This step is not easy and where most people lose the battle with new grass seed. It is important to water for quick germination and continued growth until the seedlings have a chance to deepen their roots. You will want to water about 20 minutes a day. We suggest that you do this in the morning, so that the water will help the grass get through the heat of the day. And that’s it! After about 2-3 weeks, you should be looking at a pretty nice lawn that will slowly thicken in over another week or two. Now is a great time to seed, but you can really perform this work all the way through October as well. After that, your results will sort of depend on the weather, so if it is getting too cold in November, you might want to hold off until spring.